It’s that time of year again when people start planning to get into the great outdoors. 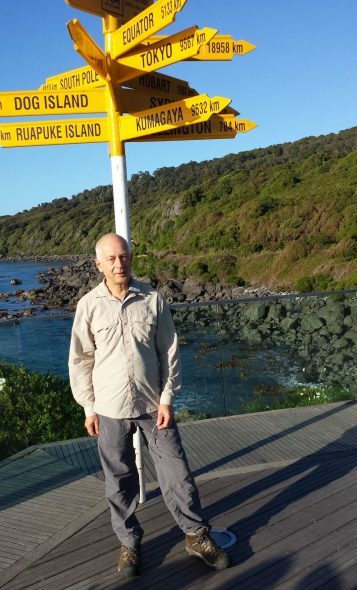 In particular, it’s the season for walking the Te Araroa Trail, the pathway from Cape Reinga in the North Island to Bluff in the South Island, some 3,000 km. I hiked the South Island leg early this year myself, which took me two months. One of the things that struck me was how much history and human connection there was to the route, but how little I knew about it, let alone had any time to attend to, when there were 30km or so to get under my belt each day. With this in mind I thought I might write some blogs reflecting on trail locations by using images from Te Papa’s collections. So let’s begin with Bluff. That’s usually thought of as the end of the trail, but increasing numbers begin there because it makes sense to move away from the coldest and wettest part of the country before the approach of winter. In the lingo of the trail these people are TA NoBos (Te Araroa northbound). I was a NoBo. 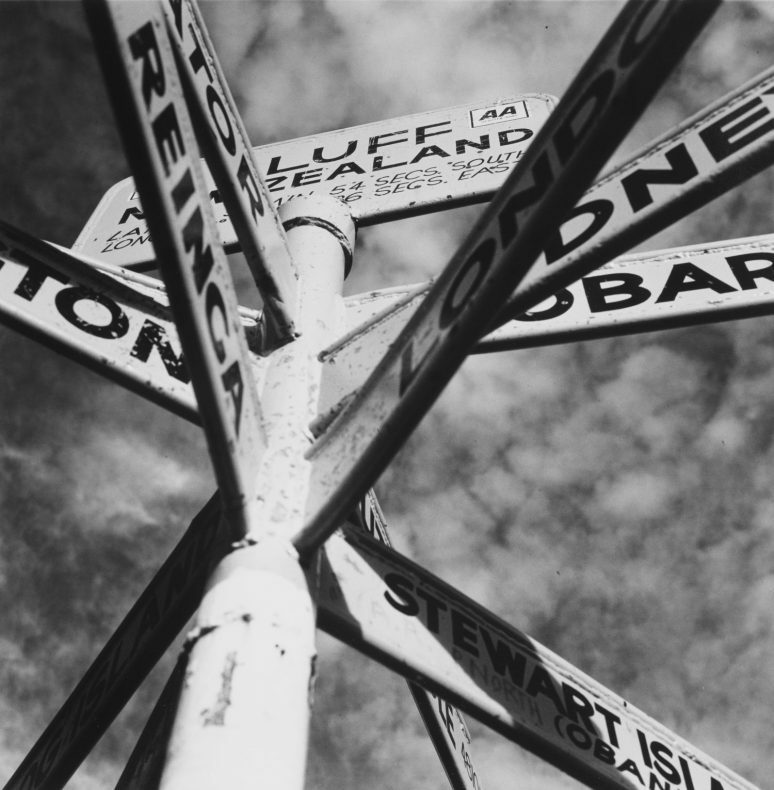 The start point in Bluff is the famous signpost at Stirling Point, about as far south as you can go in the South Island. It’s been photographed a gazillion times by tourists and I’m sure every TA walker has their photo taken there, whether just beginning or finally completing their journey. Peter Peryer. Bluff, 1985. Gelatin silver print. Purchased 1985 with Ellen Eames Collection funds. Te Papa, O.003470. But Peter Peryer created a different take on this iconic object in 1985, making the sign almost human. The other end of the trail in the South Island is at Ship Cove / Meretoto in the Queen Charlotte Sounds. There is another marker here, but this one is a monument commemorating the five visits of Captain James Cook during the 1770s. It was one of Cook’s favourite spots in New Zealand, and he spent a total of 170 days here over his three voyages. It was a secure anchorage with good supplies of wood, water, and fish. There were also opportunities to trade with Māori. John Webber. Ship Cove, Queen Charlotte Sound, c.1788. Oil on canvas. Purchased 1991 from the Bishop Suter Art Gallery, Nelson, with New Zealand Lottery Grants Board funds; gift of Sir Francis Henry Dillon Bell to the Bishop Suter Art Gallery, 1931. Te Papa, 1991-0005-1. Expedition artist John Webber made many drawings around Ship Cove during the 1777 visit, and eleven years later worked these up into a painting back in London. It is a work with documentary value, showing both Māori and Europeans engaged in a variety of activities. But it also a work made according to the artistic conventions of the time, with the figures picturesquely arranged and a golden glow mysteriously lighting the centre. Mark Adams. View at Meretoto/Ship Cove after John Webber, 11 December 1995. Gelatin silver prints. Purchased 1999 with New Zealand Lottery Grants Board funds. Te Papa, O.021983, O.021984, O.021985. Today the civilising effect that Webber imposed on the landscape has been echoed in reality, though in a rather less romantic way, to say the least. Mark Adams’ panorama depicts the same spot in 1995, with mown grass and random barbecues. Mark Adams. 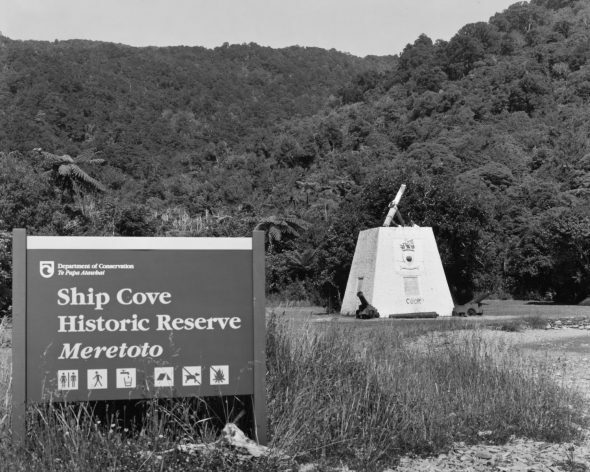 Meretoto/Ship Cove, the Cook Monument, 10 December 1995. Gelatin silver print. Purchased 1999 with New Zealand Lottery Grants Board funds. Te Papa, O.021986. More clutter of civilisation is pointedly emphasised in this photograph by Adams. While it is right and proper that such a significant site should be marked, somehow it all takes away from any imagining of how it was when Māori and Pakeha had their first sustained contact. Proclaiming history also seems to ruin it. 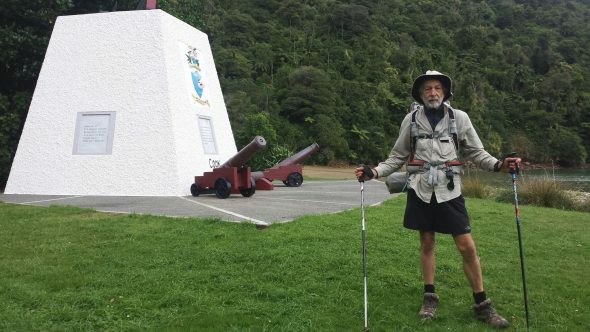 Nevertheless, the monument does offer TA walkers the opportunity for another symbolic image to witness the beginning or end of their South Island trek. Thank you. I’m looking forward to more blogs on this theme. Thanks Athol, I am reading the Trial of the Cannibal Dog by Dame Anne Salmond, these images are enriching. Thank you, Athol. I’m feeling inspired to go forth and do likewise.